​Alba was born on March 24, 2000. 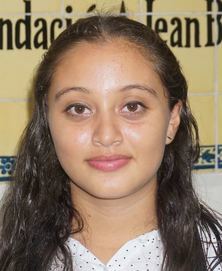 She is 17 years old and lives in the Hermano Mendoza neighborhood, 2 kilometers from the center of San Juan del Sur. Alba is the eldest child and has two brothers; her parents are: Mr. Walter Espinoza and Mrs. Aracelys Quintanilla. Alba is currently independent, living with her new family consisting of her husband and her 11-month-old daughter. Alba is economically dependent on her husband who works as a waiter in a restaurant in San Juan del Sur, and she is dedicated to household chores and her studies. Therefore, she asks for a scholarship to begin her university studies because her husband’s income only covers the basic expenses of the home. Alba currently attends the eleventh (last) year of high school in the Margareth Morganroth Gullette High School, She stands out for academic excellence with an average of 90% in the first semester of 2017, and also has participated in municipal contests of chess. Alba aspires to study public accounting on Saturdays at the Polytechnic University of Nicaragua in Rivas. Alba is a young woman with a perspective of self-improvement; she is sincere, respectful, honest and optimistic, with a good sense of social sensitivity about the problems of her community such as the sadness in many young women in our society, as well as abandonment of children in some families, and she would like to participate in a socio-educational campaign to avoid these situations.